Two eagles were spotted flying around in circles over the town of Hveragerði in South Iceland on Saturday for around half an hour. Zoologist Kristinn Haukur Skarphéðinsson says that this behaviour is unusual. "There are eagles in many areas of South Iceland and have been spotted this winter and eagles often dwell in these parts during the winter." He explains that the birds like this area because of the geothermal water and open spaces, with plenty of fish and ducks which they can hunt. The eagles were flying just above the Hveragerði convalescence home and were observed by patients. "We all watched the display and talked about it. It was quite spectactular to see. 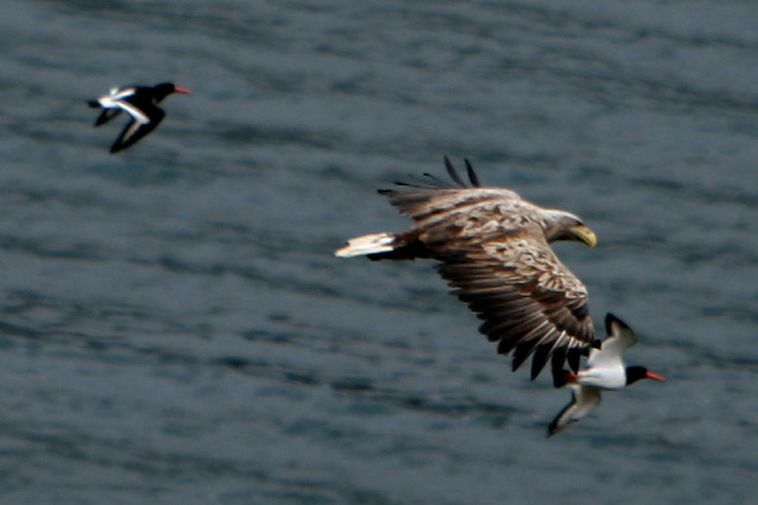 Other birds disappeared at the same time, scared of these huge predatory birds," said Guðjón Jensson, a patient who spoke with mbl.is.